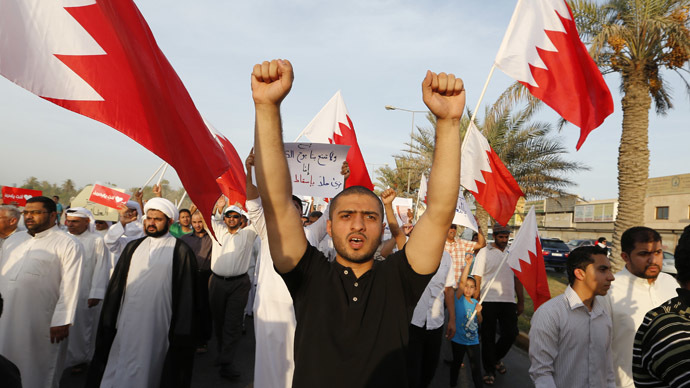 Land Destroyer: Bahrain protests: Will the House of Khalifa fall like a house of cards? Bahrain protests: Will the House of Khalifa fall like a house of cards? 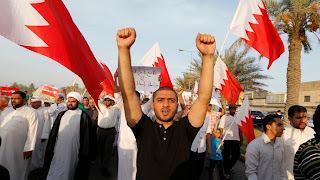 Mass protests in Bahrain are by no means a sectarian conflict, though they threaten to further entrench political polarization and serve as an ugly thorn in the Bahraini monarchy’s side unless they hear the popular calls for constitutional reform. Despite Bahraini PM Sheikh al-Khalifa’s warning to pro-democracy activists that they face longer prison sentences and the stripping of their citizenship if they take part in August 14’s scheduled opposition rally, protesters are expected to take to the streets en masse. The tiny island nation has seen near-daily protests and skirmishes between demonstrators and security forces since the regional Arab Spring protests in 2011, and the US-allied monarchy has responded with draconian measures that ban public demonstrations in the capital, Manama. The ongoing protest movement, which has been secular and largely peaceful, brought more than half the country’s 535,000 citizens onto the streets at its peak, but attracted minimal levels of attention from international media outlets. The scant coverage of the subsequent crackdown by Bahraini authorities, which included the military occupation of a public hospital and the arrest of doctors who treated injured protesters, has led many to suggest that Western and Gulf media outlets have been complicit in the monarchy’s efforts to suppress news of protests coming out of the country. The brute heavy-handedness of the monarchy, which led to the deaths of some 80 people since 2011, may have driven people into their homes and discouraged them from speaking out, but public animosity toward the reactionary regime shows no sign of letting up.